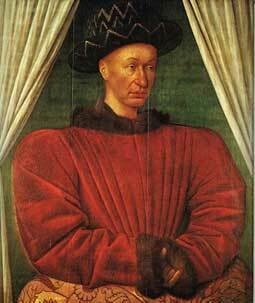 Charles VII of France was born on February 22, 1403 and died on July 22, 1461 and ruled France from 1422 until his death. Charles came to be known as "Charles the Victorious" for having ultimately won the Hundred Years War however it is his association with St. Joan of Arc for which he is best known today. As Regine Pernoud explains in her biography Joan of Arc: Her Story about Charles: "Historians often judge Charles VII harshly. His weakness during the first years of his reign, his cowardly abandonment of Joan of Arc, his later ingratitude toward Jacques Coeur, the devoted merchant who had been one of his most generous financial supporters during the rebellion of 1440, and his final years dedicated to pleasure rather than to the duties of his station make him a less than sympathetic figure, but his contribution to the restoration of the French kingdom should also be noted." Most of the criticism of Charles is warranted however Joan of Arc never had anything negative to say about Charles. Even at the end of her life facing the fire she defended him saying: "By my faith, messire, with all due reverence, I dare say to you, and to swear at the risk of my life, that he is the most noble Christian of all the Christians, and best loves the faith and the Church. He is by no means what you say!" Joan seemed to be able to see in Charles some qualities that perhaps even Charles himself did not recognize. In the end Charles VII did lead France to victory in the Hundred Years War and did live up to at least some of Joan's high hopes for him by behaving as a good Christian King in not seeking vengeance after he had won the war. While it is hard to look past all of the many faults and failures of Charles perhaps it is best to follow Joan's lead and focus on the successes that Charles VII had in his life which were exceptional.